When you choose SaveMore Commercial Laundry Equipment, you get a total solution including the most suitable commercial equipment and full support for your business. For On-Premise Laundry facilities, we analyze the main components of your laundry operation: equipment, labor and utilities. ADC and LG’s Commercial Laundry Systems are the most innovative and highest-rated energy efficiency on the market today. Did you know that residential laundry equipment warranties are void for coverage when used in an industrial or commercial setting? Don’t let this happen to your business! With LG Commercial Laundry, you get Quiet Efficiency with Commercial Warranty available in side-by-side or stacked models. Contact us today! Avoid cross-contamination with our Fire Station Package which includes one Titan PRO with 33 pound capacity for turnout gear, one Giant-C Plus with 22 pound capacity for bedding, mops and personal clothing, and a Turn-Out Gear Drying Cabinet for less than the competitor’s soft-mount machines and tumbler. Water temperature and extract speeds can be custom-programmed to stay within the NFPA and FEMSA requirements. Both the Titan PRO and Giant-C Plus have all the bells & whistles you enjoy with features you need. LG Commercial Laundry Systems has a large capacity for its small footprint of space making washing convenient. With automatic chemical injection, the Titan PRO washer disperses the right type and amount of detergents with every wash. This makes for a more effective decontamination process without damage to protective fabrics of your turnout gear. We know having a guest laundry service is attractive for families and business travelers who may need to launder items during their stay. LG is the most recognized brand in the United States and voted #1 in FRONT LOAD laundry equipment 5 years running. The LG Commercial Laundry Systems are ADA Compliant as well as being rated as the highest-rated in energy efficiency on the market today, making them the best choice for every one of your guests. Bright white fluffy towels make any guest feel special. Fresh, clean bed linen that feels like new is important for a comfortable nights sleep. It’s unrealistic to buy new towels and linen for each guest, but with the us, it’s possible to have that feeling with innovative features that provide an ultimate washing performance time and time again. The system is tough on stains, but gentle on fabric ensuring your linen will last longer. Less water and energy is used, leading to cheaper utility bills. Our mission is to offer you the latest in premium, energy-efficient LG Commercial Equipment, customer support, flexible financing and reliable service. Our services range from a single washer or dryer to a full laundry renovation or construction, including ancillary products like changers, folding tables, carts, and video security options and any other LG appliances. We offer coin, card or alternative payment vended equipment in 22 pound and 33 pound capacities- which have been proven to earn higher vend price than traditional topload machines. Plus, your tenants enjoy the benefits of the larger capacity reducing the amount their time spent washing clothes. We strive for the highest quality of care for you and your community. Whether it is for a complete laundry room makeover or your need to replace the unit’s appliances, contact us to see how we can serve you. We know that cleanliness and hygiene are vital within the health care industry. To prevent contamination and the spread of germs, it’s crucial that laundry is treated in an appropriate manner. We have the necessary equipment to reach the extremely high 194°F wash that kills harmful germs and bacteria resulting in a deeper clean and more hygienic result. Did you know that residential laundry equipment warranties are void for coverage when used in an industrial or commercial setting? Don’t let this happen to your business! With LG Commercial Laundry, you get Quiet Efficiency with Commercial Warranty available in side-by-side or stacked models. Senior citizens deserve to be in a comfortable, clean and safe environment. Our product line offers innovative features that will keep clothes, linens and towels in great condition while removing tough dirt and stains. You can trust that the high temperatures will offer a cleaner and more hygienic wash. Hair and beauty salons go through towels like they are going out of fashion! It is important that you have a washing machine that is fast, reliable and most importantly effective. LG professional laundry systems offer short washing and drying cycles that effectively remove stubborn stains and quickly dry your items. It is essential that towels are cleaned quickly and efficiently, ready for your next client. That’s why it’s important to choose the right washers and dryers with unmatched energy efficiency and durability. Unlike residential washers and dryers, LG commercial laundry systems are designed for the constant use that salons require. Your spa clients leave feeling relaxed and refreshed, but that’s not the same for your towels! Spa robes and towels face a number of lotions and potions throughout the day and it’s hard to get that deep clean feel. Now your towels can be as pampered and refreshed as your clients. It is important to have crisp clean tablecloths and hygienic clean towels and aprons in any restaurant or café, and it’s necessary to be able to wash them quickly. LG’s professional laundry system can handle large wash loads that can be washed and dried in record time; these features differentiate the professional system from the household system. 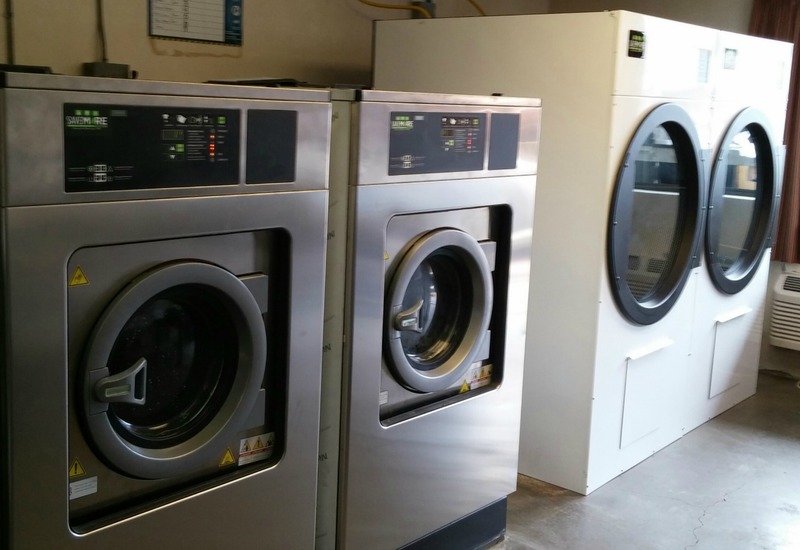 Having reliable laundry equipment is key to maintaining a well-run athletic facility. LG’s commercial laundry equipment saves time, cuts utility costs and perfectly cleans uniforms, warm-ups and towels while still being the most durable machine in its class- beating out the competition in energy efficiency, intelligence and design. The AdaptAble™ Controls are always within reach when stacking machines and fits within the same footprint as traditional equipment. Children are susceptible to all types of illnesses so a clean safe environment is a must. By keeping blankets, clothing and all fabrics free from germs and bacteria the risk of infection is reduced. LG’s professional laundry system can reach high temperatures that will remove these germs. The large drum meets the demand of heavy loads while removing tough stains and dirt.